This LP was released through Lynx label in 1980 ,as Galerie Schema edition,of course limited(i heard about 100 copies only). It can be performed by any kind and number of instruments or voices. Only one instruments must play ad libitum the series with the last three or four notes (right) at random, but returning always to A flat. All other instruments and voices can be well tuned or fluctuate within a very small interval above and below the notes frequency of the instrument playng ad libitum: they can't play more then five notes of the series for each performance. 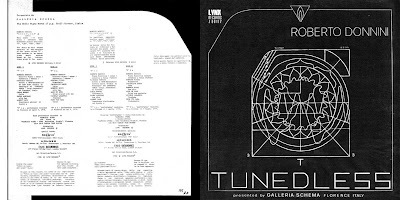 Donnini has 2 further releases ,Tunedless 2 in 1987 and Fluxmar in 1992,both limited edition also ,through Lynx label. My first introduction to your blog, and a sublime way to begin. Thank you kindly. Valerio Cosi, a young and super promising musician from Italy (a true genius) has recorded a song called "Study For Saxophone And Electronics (Dedicated To Roberto Donnini)". This song could be found in his album called "Heavy Electronic Pacific Rock" released 3 years ago on Digitalis Industries...It is AMAZING stuff!